Francis and Barry's "Religion of Peace"
Doing what comes naturally to them as it is how their false "prophet," Mohammed, spread his false, blasphemous religion that is but a mockery of the Most Holy Trinity, Mohammedans in Egypt have been doing what they do best in recent days: kill other human beings. After all, Mohammed conceived his false religion as a means of pan-Arabism against "foreign" influences, sweeping away over six centuries of Catholicism in much of North Africa. Only vestiges, mostly of a heretical nature, remain in Egypt. Yes, Egypt is a land that was blessed by the very presence of the Second Person of the Most Blessed Trinity made Man in His Most Blessed Mother's Virginal and Immaculate Womb, Our Blessed Lord and Saviour Jesus Christ, during the time that the Holy Family had taken flight into Egypt until the death of King Herod the Great. Saint Joseph, the Patron of the Universal Church and the Protector of the Faithful, found refuge for his Most Chaste Spouse and his Divine foster-Child in Egypt. He toiled as a carpenter in Egypt. He learned the ways of the Egyptians. This was all done to fulfill the words of Sacred Scripture as Our Lord, the New Moses, was called out of Egypt to the Promised Land that Moses was permitted to see but not permitted to enter prior to his death. Our Lord returned to the Promised Land of the Patriarchs and Prophets to redeem us so that we could have the opportunity to be partakers of the true and eternal Promised Land that is Heaven itself. Egypt is much favored by Our Lord and His Most Blessed Mother and His foster-father, Saint Joseph. Much favored. Egypt was served by, among others, Saint Athanasius and Saint Cyril of Alexandria and Saint Peter of Alexandria. Alexandria was the city in which Saint Catherine of Alexandria was born and from which she traveled to Rome, suffering martyrdom there before her body was taken by angels to Mount Sinai. Mystics have written about how the very presence of Our Blessed Lord and Saviour Jesus Christ in Egypt predisposed this country to produce such great saints, some of whom suffered at the hands of pagans, in such a short space of time after His Resurrection and Ascension into Heaven and the beginning of the missionary work of Holy Mother Church following the descent of the Third Person of the Most Blessed Trinity, God the Holy Ghost, upon the Apostles and Our Lady and the others who were gathered in the same Upper Room in Jerusalem where He had instituted the Holy Eucharist and the Holy Priesthood at the Last Supper fifty-three days before. Egypt is the land not only of the Egyptian saints listed above, it is the land of Saints Antony of the Desert and Saint Paul the Hermit, who was buried in a tunic that had been worn by Saint Athanasius and who was visited when he was 113 years old by the great son of Dalmatia, Saint Jerome, and Saint Paul the Simple and Saints Chrysanthus and Daria and Saint Dorothy and Saint Maurice and his companions of the Thebian Legion and Saint Vitalis and Saint Mary of Egypt, among scores of others! Egypt was a land suffused with Catholicism. This is why the devil struck at the heart of this country by means of those who belonged to the false religion known as Mohammedanism in the Seventh Century Anno Domini, and it is this Mohammedan invasion of Egypt that is responsible for the chaos there today as Catholicism is but the one and only foundation of personal and social order. The remote cause of the distress being visited upon Egypt now, which certainly has many and sundry proximate causes, to be sure, is the replacement of Catholicism by Mohammedanism as the driving force in Egypt, and no amount of Judeo-Masonic drivel from either Barack Hussein Obama/Barry Soetoro or Jorge Mario Bergoglio/Francis is going to stop bloodshed in Egypt as the shedding of blood is part and parcel of the Mohammedan religion. Similarly, Jorge Mario Bergoglio/Francis, stuck in his own delusional beliefs that "peace and reconciliation" can be realize in land where all but ten percent of the population of Mohammedan, issued an equally Judeo-Masonic message in order not to offend the tender sensibilities of Mohammedans whom he believes can be convinced to become participants in "dialogue" in order to make their false religion an instrument in the building up of the mythical fantasy of Karol Wojtyla/John Paul II, the "civilization of love." (Vatican Radio) Pope Francis on Thursday lamented the "painful news" coming from Egypt following the bloody crackdown there by security forces on protesters and appealed for "peace, dialogue and reconciliation." The following is a translation into English of his remarks which came at the end of his Angelus address in the papal summer residence of Castel Gandolfo where he had just celebrated an open-air mass to mark the Solemnity of Mary's Assumption into Heaven. The irony here is that Obama/Soetoro's remarks could have been given by Bergoglio/Francis and the latter's remarks could have been given by the former. The lords of Modernity in the world and those of Modernism in the counterfeit church of conciliarism are, after all, kindred spirits of the New World Order of Judeo-Masonry. Both sets of delusional adherents of Judeo-Masonry, which is founded upon a rejection of the Social Reign of Christ the King and a belief that men can work together as "brothers" for the "better world," can never quite figure out how it is that all of their pleas for "peace" in the Middle East fall upon deaf ears. This is because they reject the simple fact that Catholicism is the one and only foundation of personal and social order. Remember, Bergoglio/Francis himself sent a message to the Mohammedans at the end of their false holiday, Ramadan, last month, extolling how important it is for "Muslims and Christians" to promote "mutual respect through education:"
Focusing on the theme ‘Promoting mutual respect through education’, the message stresses the importance of thinking, speaking and writing respectfully about others and always avoiding unfair criticism or defamation. Families, schools, religious teaching and the media, it says, all have a role to play in achieving this goal.Underlining the importance of positive interreligious relations, the Pope says Christians and Muslims are called to respect the teachings, symbols, values and especially the leaders and places of worship of the other religion. To quote John Joseph "Jackie Boy" Sullivan, these men are "out of their cotton pickins'." The Egyptian defense minister has ordered the repair and reconstruction of all churches that suffered damage in the country’s violent demonstrations since the Egyptian military removed President Mohamed Morsi from power last month. Defense minister Col. Gen. Abdel Fattah El-Sisi intends to fix the damage to Coptic churches at Rabaa Adaweya and Nahda squares, according to a report by the Mid-East Christian News. Dozens of churches were attacked and burned in riots after thousands of demonstrators took to the streets of Cairo and other Egyptian cities to demand the end of what they call military rule, following the removal of Morsi on July 3. Many of Morsi's supporters have voiced criticism at Egypt's Christian minority for largely supporting the military's decision to oust him from office. 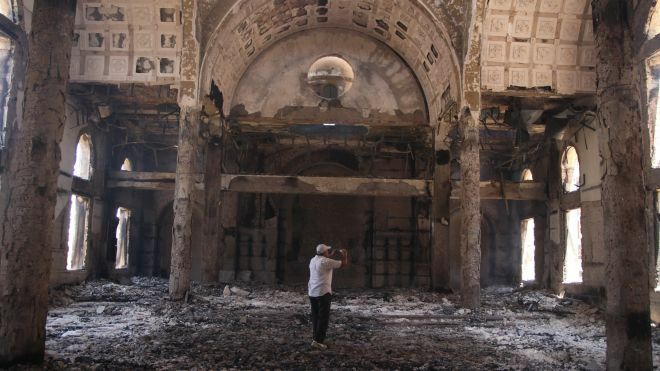 “The Egyptian defense minister ordered the engineering department of the armed forces to swiftly repair all the affected churches, in recognition of the historical and national role played by our Coptic brothers,” read a statement that aired on Egyptian television. Bishop Mousa thanked Sisi for his efforts to repair the damaged churches. “We thank Col. Gen. Sisi for commissioning the brave Egyptian armed forces to rebuild the places of worship damaged during the recent events,” Bishop Mousa said on Twitter. 17 deaths were reported Friday after several days of violence that caused more than 638 deaths and 4,000 injuries in clashes between Morsi supporters and Egyptian military forces. The Maspero Youth Union, a Coptic Christian youth movement, says there’s a "retaliation war" against the religious minority, which makes up around 10 percent of Egypt's population, according to a report by AFP. The truth is, however, that even the lion's share of Mohammedan "clerics" and those who follow them do not believe any of this as they take their false religion seriously. Drawing upon the riches of our respective religious traditions, we must spread awareness that today's problems will not be solved if we remain ignorant of one another and isolated from one another. We are all aware of past misunderstandings and conflicts, and these still weigh heavily upon relationships between Jews, Christians and Muslims. We must do all we can to turn awareness of past offences and sins into a firm resolve to build a new future in which there will be nothing but respectful and fruitful cooperation between us. Seeking the conversion of others is an "imposition" of "views" upon others? So much for the work of the Franciscan pro-martyrs who went to North Africa to seek to convert the Mohammedans. So much for the work of Saint Francis himself (see Mr. Frank Rega's Saint Francis of Assisi and the Conversion of the Muslims). So much for the work of countless others, including Saint Vincent Ferrer. O.P., who converted thousand of Mohammedans and Talmudists in southern France and the Iberian Peninsula at the end of the Fourteenth and beginning of the Fifteenth Centuries. It is a very telling commentary on the state of conciliar revolution that there at least some times when members of non-Catholic religions show more concern for the "integrity" of their false religions, each of which is from the devil, than most Catholics alive today have for the integrity of the one and only true religion, Catholicism. The so-called "Arab Spring" of early-2011 was exalted by a man who has a Mohammedan name and had a Mohammedan father and stepfather, Barack Hussein Obama, and by a supposed Catholic, the now retired Joseph Ratzinger/Benedict XVI, who went so far as to take off his shoes to enter into two Mohammedan mosques and even once assumed the Mohammedan "prayer" position at the behest of his Mohammedan host as he turned in the direction of Mecca, something that a true Successor of Saint Peter would have never done. See Blood Flows Freely in America and Libya, Refusing to Read the Signs of the Times, Idols to the Left, Idols to the Right, part 1, Hey, Buddy, Don't You Know That There's a War Going On Now?, Sitting Atop Mount Olympus, Above the Law of God and Man and Want to Reconsider the Lesser of Two Evils Business, Folks?. Sure, Christians and Mohammedans have lived in relative peace in places such as Iraq, Jordan and Lebanon and even Palestine before the Zionist takeover in 1948. There has been relative peace in Egypt over the years largely because of the strong men who have led the country prior to the ouster of President Hosni Mubarak last in 2011. Note that I used the phrase "relative peace." Egyptian President Anwar Sadat had the Coptic "pope," Shenouda III, who died at the age of eighty-eight on March 18, 2012, arrested and banished to a desert monastery, where he stayed for four years until the man who succeeded Sadat after the latter's assassination on October 6, 1981, Hosni Mubarak, ended the exile and developed a good working relationship with him. Much like Saddam Hussein in Iraq, Hosni Mubarak abused his powers. However, it is Arab strongmen such as Mubarak who protected Christians from being attacked by Mohammedans. Not so now. Not so in the future, not even with the Egyptian military promising to rebuild Coptic churches that have been destroyed in the past week. The Arab strong men are mostly gone, noting that Bahsar al-Assad continues his bloodletting in Syria. Believing, faithful, orthodox Mohammedans who want nothing of "dialogue" or "peaceful coexistence" with those they consider infidels are on the rise. Does Barack Hussein Obama/Barry Soetoro care? No. Such Mohammedans are simply "radicals." This is also the belief of the conciliar "Master of Dialogue Without Peer," Jorge Mario Bergoglio/Francis, who beckons Mohammedans to enter into a "full communion" of joy and fellowship by means of "inter-religious dialogue" and respect for "religious freedom." Bergoglio/Francis's predecessor, Ratzinger/Benedict, praised Mohammedans during both of his visits to the Middle East, doing so in the belief that such overtures would secure the safety of Catholic minorities who live in Mohammedan nations, which means that he might as well be an employee of the American embassy in Cairo, Egypt. My visit to Jordan gives me a welcome opportunity to speak of my deep respect for the Muslim community, and to pay tribute to the leadership shown by His Majesty the King in promoting a better understanding of the virtues proclaimed by Islam. Now that some years have passed since the publication of the Amman Message and the Amman Interfaith Message, we can say that these worthy initiatives have achieved much good in furthering an alliance of civilizations between the West and the Muslim world, confounding the predictions of those who consider violence and conflict inevitable. Indeed the Kingdom of Jordan has long been at the forefront of initiatives to promote peace in the Middle East and throughout the world, encouraging inter-religious dialogue, supporting efforts to find a just solution to the Israeli-Palestinian conflict, welcoming refugees from neighboring Iraq, and seeking to curb extremism. I cannot let this opportunity pass without calling to mind the pioneering efforts for peace in the region made by the late King Hussein. How fitting that my meeting tomorrow with Muslim religious leaders, the diplomatic corps and University rectors should take place in the mosque that bears his name. May his commitment to the resolution of the region’s conflicts continue to bear fruit in efforts to promote lasting peace and true justice for all who live in the Middle East. Places of worship, like this splendid Al-Hussein Bin Talal mosque named after the revered late King, stand out like jewels across the earth’s surface. From the ancient to the modern, the magnificent to the humble, they all point to the divine, to the Transcendent One, to the Almighty. And through the centuries these sanctuaries have drawn men and women into their sacred space to pause, to pray, to acknowledge the presence of the Almighty, and to recognize that we are all his creatures. In 2005, then Pope Benedict, while quoting from an obscure medieval text, declared that the Prophet Mohammed, founder of the Islamic faith, was "evil and inhuman", enraging the Muslim population and causing attacks on churches throughout the world before an apology was issued. "The only thing that didn't happen to Bergoglio was being removed from his post", wrote investigative journalist Horacio Verbitsky in his column in left-wing daily newspaper Página/24. "The Vatican was very quick to react,"
One of the titles of the Bishop of Rome is Pontiff, that is, a builder of bridges with God and between people. My wish is that the dialogue between us should help to build bridges connecting all people, in such a way that everyone can see in the other not an enemy, not a rival, but a brother or sister to be welcomed and embraced! My own origins impel me to work for the building of bridges. As you know, my family is of Italian origin; and so this dialogue between places and cultures a great distance apart matters greatly to me, this dialogue between one end of the world and the other, which today are growing ever closer, more interdependent, more in need of opportunities to meet and to create real spaces of authentic fraternity. In this work, the role of religion is fundamental. It is not possible to build bridges between people while forgetting God. But the converse is also true: it is not possible to establish true links with God, while ignoring other people. Hence it is important to intensify dialogue among the various religions, and I am thinking particularly of dialogue with Islam. At the Mass marking the beginning of my ministry, I greatly appreciated the presence of so many civil and religious leaders from the Islamic world. And it is also important to intensify outreach to non-believers, so that the differences which divide and hurt us may never prevail, but rather the desire to build true links of friendship between all peoples, despite their diversity. Fighting poverty, both material and spiritual, building peace and constructing bridges: these, as it were, are the reference points for a journey that I want to invite each of the countries here represented to take up. But it is a difficult journey, if we do not learn to grow in love for this world of ours. Here too, it helps me to think of the name of Francis, who teaches us profound respect for the whole of creation and the protection of our environment, which all too often, instead of using for the good, we exploit greedily, to one another’s detriment. This is the precise apostate spirit of The Sillon that was condemned by Pope Saint Pius X in Notre Charge Apostolique, August 15, 1910. While popes have for centuries washed the feet of the faithful on the day before Good Friday, never before had a pontiff washed the feet of a woman. That one of the female inmates at the prison in Rome was also a Serbian Muslim was also a break with tradition. “There is no better way to show his service for the smallest, for the least fortunate,” said Gaetano Greco, a local chaplain. Pope Francis washed the feet of 12 inmates aged 14 to 21, among them the two women, the second of whom was an Italian Catholic. Mr Greco said he hoped the ritual would be “a positive sign in their lives”. Neither Jorge Mario Bergoglio/Francis or Barack Hussein Obama/Barry Soetoro believe this to be true, and that is why they can believe that Mohammedanism is "a religion of peace" when it is nothing other than a false, blasphemous mockery of the true God of Divine Revelation, the Most Blessed Trinity, and violent of its very wickedly diabolical nature. We are not going to stop the tide of the threats posed by Mohammedanism and other false religions with any form of naturalism, with any highly emotionally laden appeals to waste one's Catholic time and money on compact discs and books and other materials produced by dopes who have not studied the Social Reign of Christ the King and who evangelize in behalf of one Americanist and/or conciliarist myth after another that can do nothing but reaffirm people in a welter of errors just as surely as do Bergoglio/Francis himself and his "bishops." We must avoid all contact with these agents of error and indifferentism. We pray for the conversion of Barack Hussein Obama and all other naturalists. We pray for the conversion of Jorge Mario Bergoglio/Francis and for his fellow conciliarists. We pray and weep as we make reparation to the Most Sacred Heart of Jesus through the Sorrowful and Immaculate Heart of Mary for our own many sins. We must, however, remember that there is nothing serendipitous about Mohammedanism, which is unleashing a new wave of violence against Christians in Egypt, Iraq and Syria. We must oppose this false religion, whose adherents are in the very grip of the devil by means of Original Sin, and we must oppose the false, naturalistic, religiously indifferentist, anti-Incarnational and semi-Pelagian principles of Modernity with which the conciliarists have made their "reconciliation" that teach us that we should not Mohammedan violence by its proper name and identify it as part and parcel of its very founding, history and tenets. We have been given Our Lady's Rosary to help us in this time of apostasy and betrayal, in this time of chastisement. Let us use this instrument, well as we seek to deny ourselves more and more so that our hearts will yearn only for the things of Heaven and that we will be more and more able to view the world exclusively through the eyes of the true Faith as we, unworthy though we may be, plant a few seeds for the restoration of the Social Reign of Christ the King and of Mary our Immaculate Queen! Saint Agapitus, pray for us.